I ran into Aatin Anadkat of Maiyango at last week’s Winter Food Festival at Leicester Market. He was buzzing over the prospects for his business – “these last few weeks it’s like I’ve had a shot of adrenaline” he told me. Aatin launched the restaurant when not long out of University. It was stylish, cosmopolitan and offered something new for Leicester. Over the last decade Aatin and his colleagues showed considerable savvy and skill to not just secure the restaurant and bar, but to develop the City’s smartest boutique hotel, a banqueting operation running out of the St Martin’s House by the Cathedral and a Kitchen Deli on Highcross St. So when his long-term head chef and friend Phil Sharpe left last month to set up on his own at The White Peacock, it was naturally one of the occasions when you drag out that old (apparently erroneous) notion that the Chinese word for crisis equates to “danger and opportunity”. So, hence the adrenaline. The opportunity to refresh the operation has seen the appointment of Nick Wilson as head chef. He is a hugely experienced chef but appears to be a great fit for Maiyango. At a tasting session last week he provided a mightily impressive debut for a group of experienced and hard-to-please diners. Things started off with Maiyango’s typically inventive cocktails (chilli and lemongrass mojito, star anise-flavoured oriental julep) and canapés including an exceptionally gorgeous cod and chorizo samosa. 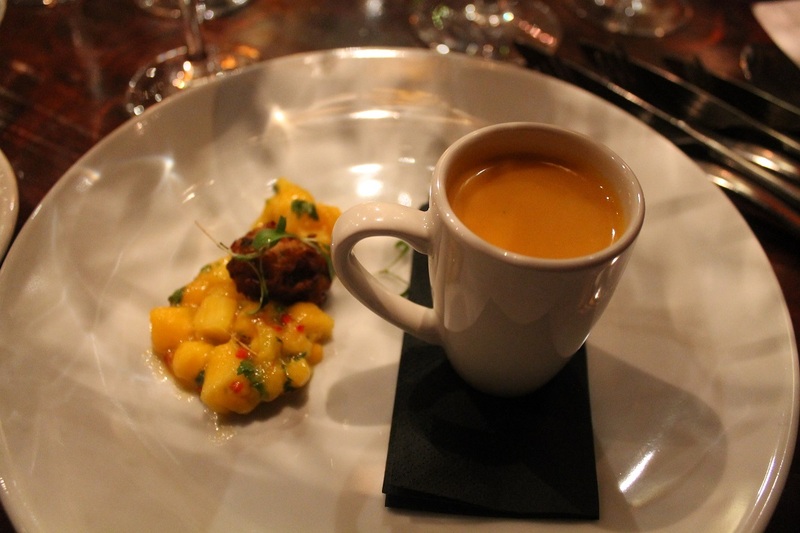 The starter of a smooth sweet potato and chipotle veloute gave a real tingle to the tongue but was brilliantly paired with a cooling mango salsa and crunchy kohlrabi bhaji. “We’re not doing fusion food.’ said our maître d’. “We say this is modern European food with influences from the East”. Fusion cooking doesn’t have a great name, but with food this good I don’t really mind what you call it. Next up came distinctly Eastern tandoori paneer and vegetable skewers with carrot pickle, sag aloo salad and a belting cherry tomato jam. Well cooked, with nicely balanced flavours, this was another winner. 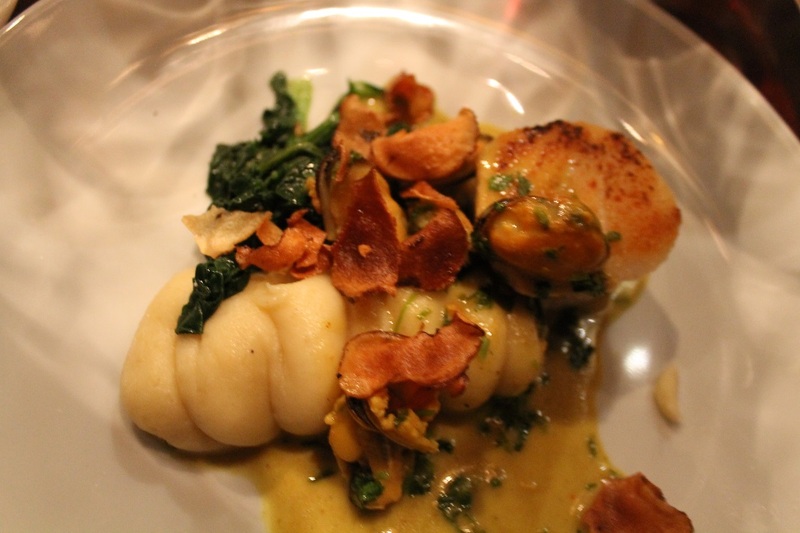 Then came what I think most people thought was the star dish of the night – perfectly roasted cod with a seared edge, rich and smooth celeriac puree, crunchy aubergine crisps, wilted spinach and fantastic mussels with a lightly curried creamy broth. Great cooking and a very well-conceived dish. To serve at least 30 people more or less at once and get things so right suggests Chef Wilson has very quickly got things right in the kitchen. The main course of duck was a showstopper but for me had one or two elements too much. The duck breast was great, the hash of duck leg in a sweetish/sourish sauce was really great. Cayenne potatoes could have been a bit spicier and a bit crunchier, and while the bok choi and date puree both worked, another puree (squash? 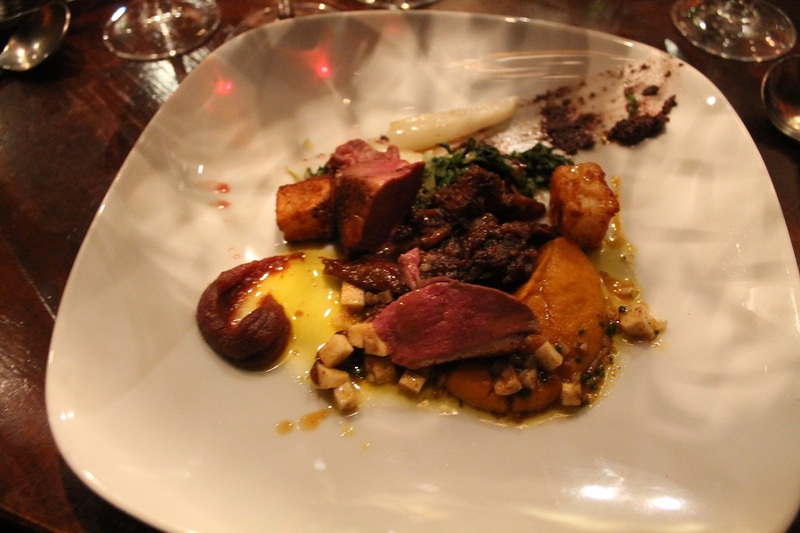 ), orange and vanilla syrup and a smear of tapenade seemed to take the focus away from the main event of the dish. Some of the combinations worked in the mouth, others didn’t. Desert featured a cardamom and white chocolate brulee. Cardamom can be a bit of a beast used in delicate puds, but I thought the balance here was spot on and the result was totally delicious. Overall then – very good cooking, well-composed dishes, served up by well-trained and charming staff. I spoke to several people afterwards who said they’d always enjoyed Maiyango but had maybe got a little bored of the menu – and they were now eager to come back and try again. No doubt that will music to Aatin’s ears. For Leicester diners, it seems the shot in the arm provided by a bit of friendly rivalry could have rich dividends. A lovely afternoon at Leicester’s summer food festival. Good to catch up with with people such as cider maker Rob Norton (right) of the Bottle Kicking Cider Company. 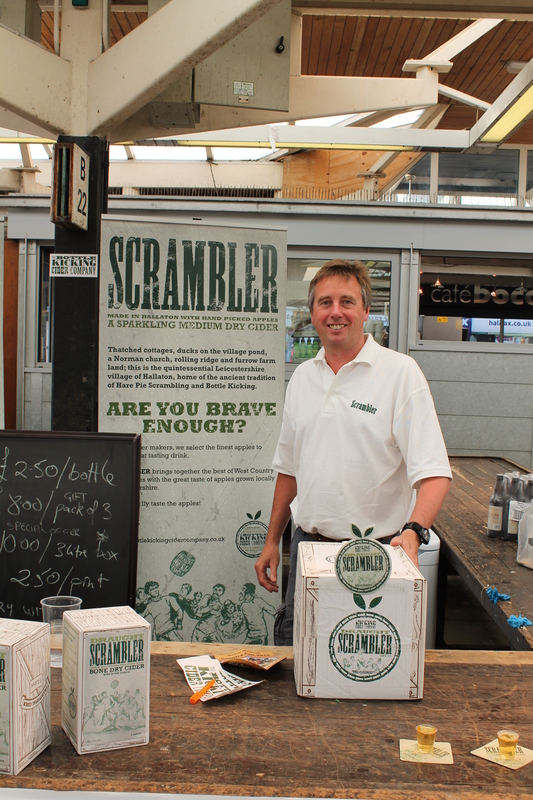 The company is going so well he’s gone full-time and has just launched a second brew – Rambler is a lighter, 4.9 per cent version of his Scrambler, which will shortly be appearing in local Tesco’s as well as Waitrose. 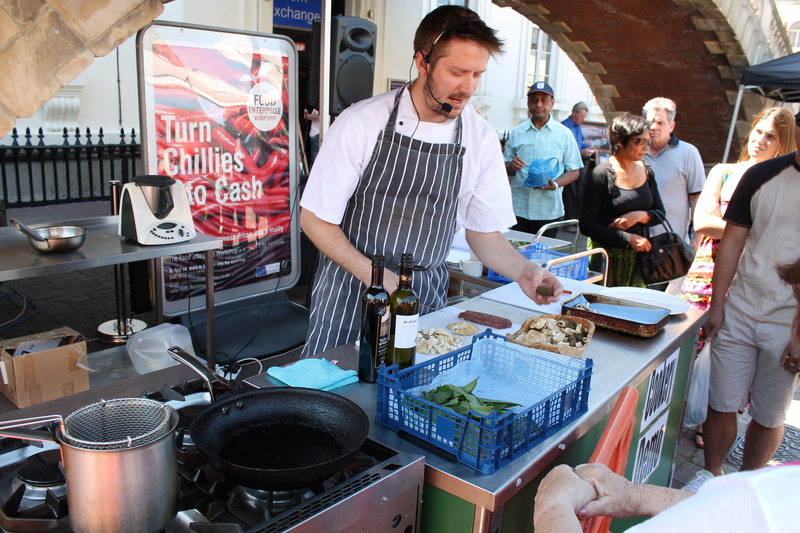 Also enjoyed watching Tom Cockerill of Entropy doing some live cooking (below). In a profession not short of its egoitistical prima donnas, Tom is an extremely laid back character (I should say I’ve never worked a service with him, so his staff may have a different view, but I doubt it). His unusally casual manner disguises a very skilled and precise approach to his food. His dish was a loin of Leicestershire lamb (a gorgeous looking cut from Archers on Queen”s Roaad) that was given a wild garlic crust and a stuffing of locally foraged wild mushrooms. I held back from the unseemly scrum to taste it but I’m sure it was fantastic. The wild garlic had been picked that morning from Castle Gardens – where as luck would have it i was haded for a picinic after the festival. There’s plenty still there, so I picked a discreet handful which is going to enliven a risotto tonight. 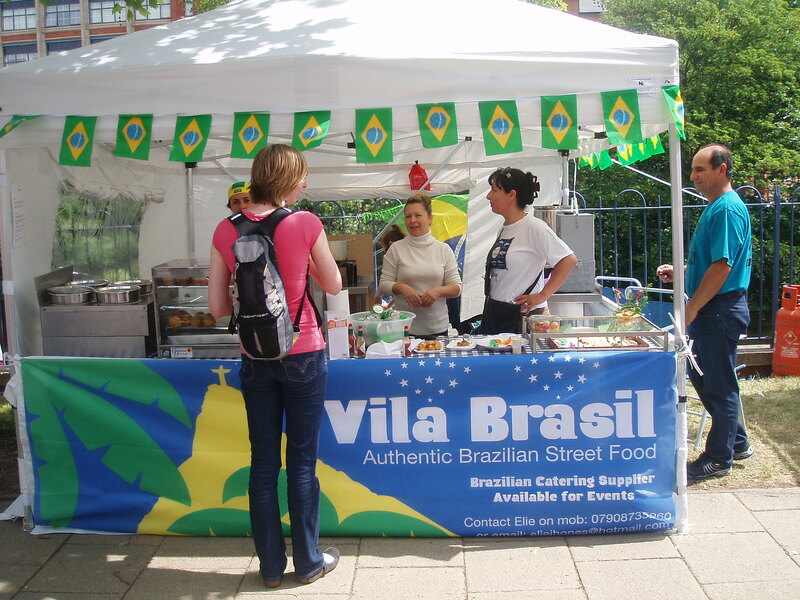 For those of you heading over to the Leicester’s Summer Food Festival this coming Sunday, let me give you a little steer to visit my friend Eliene’s stall Vila Brasil. She’ll be serving up quality Brazilian street food, including the national dish feijoida – a feisty black bean stew, a fish stew with rice and delicacies like coxinhas – plump little pastries with chicken or fish fillings. Those of you on the recent Critical Mass bike ride may have enjoyed Eli’s food at the after party at the Crumbling Cookie and you’ll know how tasty it is. For the rest of you, it’s a treat in store. Sadly I won’t be there as I’m off to Alsace for choucroute and a glass of gewurztraminer – but if you see her, have a chat, buy some food and say hi from Tim. Here’s Elie’s stall at Leicester’s Riverside Festival on 3rd June. Watch out for her at other events over the summer. Well the Market Corner launch all seemed to go off with bags of good will. The presence of the new mayor at his first public function helped and there seemed to be a feel good factor all round. Look, I know you probably want pictures of creamy cakes or spicy curries but what you've got is Cllr Westley, Mayor Soulsby and Cllr Alfonso and you'll just have to live with it for now. There was particular satisfaction from Cllr Paul Westley, who’s family has been on the market for over 100 years, and who had had to really battle against some who wanted to resist the change. Chatting with Westley and newly-elected Councillor Dawn Alfonso, a leading figure with the Market Trader’s Federation, there was a clear sense both of their passion for the 2,000 year old market and their relief at reaching this key stage in the regeneration of the area and of a refocussing of the market towards quality. They know, as is obvious, the process doesn’t stop here but must involve other areas of the market along too. There will be different solutions for different aspects but the market will have to shed any lingering reputation for knocking out cheap poor quality, end of life goods and the meat, game and fish market must somewhow be revived and reintegrated. 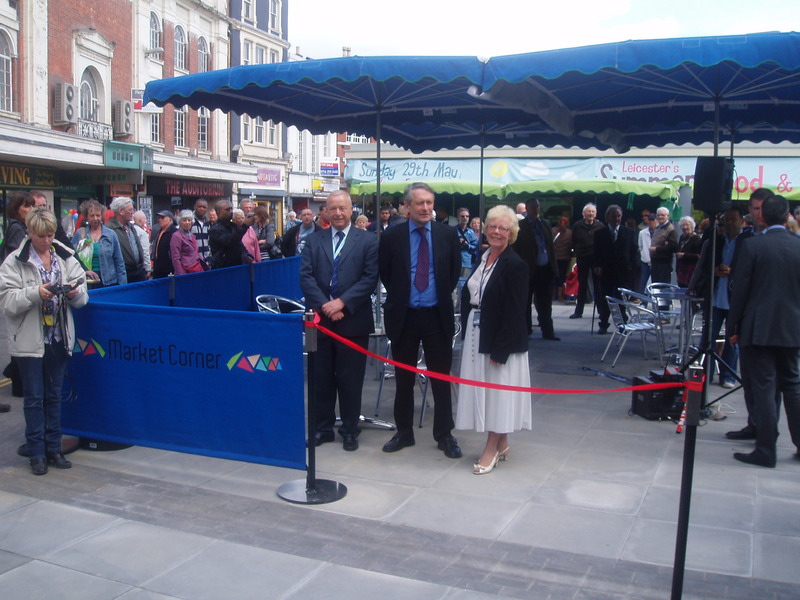 As for Market Corner itself, there was a buzz on opening day and if the area can be kept clean and tidy I think trade will continue to find its way there. It’s great that businesses like Bobby’s, Pick’s Farm, Woodhouse Farm and Deliflavour now have a regular city centre presence – their coffee is defintely worth a try. There were also few new people to me – the cakes at Dessert Island were lovely, and I was even won over by the cupcakes at Viva la Cupcake . Food stalls will be there Fridays and Saturdays. The launch comes handily before the latest Summer Food festival – always an enjoyable event – which takes place on Sunday 29 May and will feature live presentations from people such as Bobby’s, Entropy and the Rutland and Derby deli-pub. Sadly I’ll be off enjoying choucroute in Alsace, but I do hope to be around for the small but equally enjoyable Belgrave Hall Food Fair which takes place 17 and 18 September – put in your diaries. A quick reminder that the Winter Food Festival takes place this coming Sunday, 21 November from 11 -5.00pm at Leicester Market. Cannily timed to cash-in on the crowds that come in for the Xmas lights switch-on, the event attracted 15,000 last year and all 200 stalls are taken this year. Events include a demonstration of Stilton-making from the people at Long Clawson dairy (12.30pm) but from what I remember of last year I’ll be looking forward to finding some quality game. In other news, more plaudits for the Olive Branch in Clipsham, rated the nation’s sixth best gastro pub in a list of the top 50 by trade mag the Morning Advertiser. I reckon I’ve been been to ten of them and if the Olive Branch really merits beating the Sportsman, near Whitstable, by six places then it must be on very good form indeed.